Evergreen Podcasts, a Cleveland, Ohio-based podcast network, has partnered with Twin Sisters Digital Media®, an Akron, OH-based creator and provider of high quality, educational books and music for children of all ages. Karen Mitzo Hilderbrand and Kim Mitzo Thompson are the twins behind Twin Sisters®. They believe in the powerful teaching aspect of music and how it contributes to both the learning process and the learning environment. 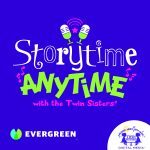 The Storytime Anytime® podcast created and narrated by the Twin Sisters launched on Evergreen Podcasts on January 10, 2019 . This fun children’s podcast is filled with music, wonderful stories and learning. Kids explore fun topics like dinosaurs, sharks, animals, and more. Over the past 32 years Twin Sisters® have been writing and producing educational and inspirational products for children. With more than 50 million albums sold and over 170 awards, including nine Record Industry Association of America (RIAA) certified Gold albums and one Platinum album, Twin Sisters® positions itself as the leader in children’s educational music. “Studies show that the earlier and more varied a young child’s music experiences, the greater the prospect for growth and cognitive development,” says Kim Mitzo Thompson, president of Twin Sisters® Digital Media. “That is why we are excited to partner with Evergreen Podcasts to bring wholesome music and stories to children and their families with Storytime Anytime®, adds Karen Hilderbrand, Twin Sisters®, CEO. The first three episodes are available on iTunes, Spotify, Stitcher, Google Play Music, EvergreenPodcasts.com and TwinSisters.com/podcast. Episodes will be released every Wednesday. Do you like bears? Would you like to learn all about bears and then meet the most famous bears of all? Come join us on Storytime…Anytime® and learn fascinating facts about these magnificent wild animals. Then meet Papa Bear, Mama Bear, and Baby Bear…and of course, curious Goldilocks, too! Authentic sound-effects, fun songs, and engaging stories make for the perfect combination of learning and entertainment. Ep 2. What a Zoo! Where can you find exotic and beautiful animals? Why, at the zoo! Join us for singing and fun as we take an exciting trip to the grasslands of Africa to learn about elephants, cheetahs, giraffes and more! Then we’re off to a zoo for a wacky field trip! Authentic sound-effects, fun songs, and engaging stories make for the perfect combination of learning and entertainment. What’s the best part about having a brother or sister? Having a best friend for life! Family is important, and there are few bonds that can be as strong as the one you can have with a sibling. Join the twins behind Twin Sister’s Storytime…Anytime® for songs, stories and fun! Sing along to a new spin on a classic song, “Five Little Monkeys Jump on the Bed”. Then go on an adventure to “The Land of Peek-a-Boo” before going on a fun family trip in “The Happy Little Engine”. Wacky sound-effects, fun songs, and endearing stories makes storytime the best time of the day. Evergreen Podcasts is a community where people think big without talking down. We are boots on the ground storytellers, who love capturing the color and diversity of modern makers. From entrepreneurs and musicians, to philosophers and artists – we are in the business of uniting audiences. EvergreenPodcasts.com hosts a diverse and dynamically curated blend of creative shows, featuring a wide range of lifestyle and niche programming. Listen up. Listen in. Listen good. Evergreen Podcasts is part of The Front Porch Media Network.